Published in the Dover Express, 26 June, 1981. 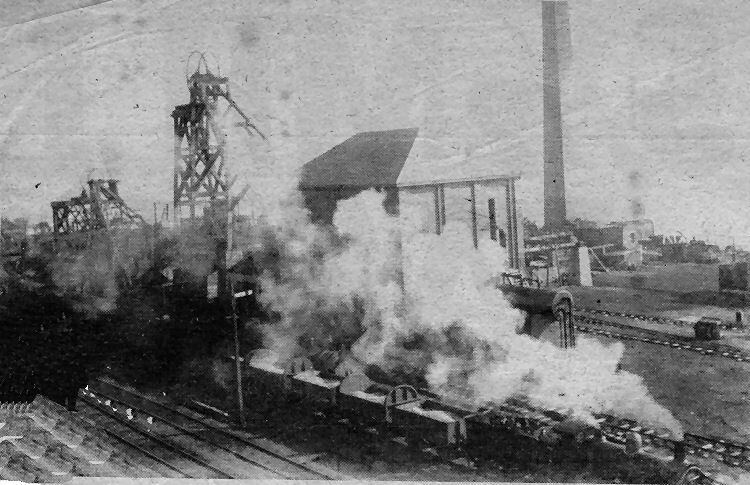 The exploration of the Kent coal field was commenced at Dover, and though the shafts sunk on the shore west of Shakespeare Cliff were abandoned owing to water difficulties, the pioneer work there, undoubtedly led to the sinking of the four collieries in East Kent that at the end of 1933 were raising over two million tons of coal annually and providing jobs for up to 7,000 workers. The possibility of coal being found in Kent was for many years the dream of geologists. The first test boring was made at Netherfield, near Battle, in 1872, but a depth of 1,905ft was reached without meeting coal measures. Another boring in West Kent was also unsuccessful. In 1886, Sir Edward Watkin, Chairman of the South Eastern Railway Company, who was also associated with the Channel Tunnel Company (whose experimental tunnelling under the sea had been vetoed by the Board of Trade) undertook a further test of the theory of geologists. He arranged with Mr Francis Brady, Engineer of the South Eastern Railway, to put down a boring on the shore at the west side of Shakespeare Cliff, with Professor W. Boyd Dawkins (who was knighted in 1919) as geological adviser. Coal was reached at 1,100ft in February 1890, and between that depth and 2,274ft they struck fourteen seams of coal, varying from 6in to 4ft in thickness. In 1896 steps were taken to make practical use of this discovery, and the sinking of what was named the Brady Pit was commenced, 280ft west of the borehole. Mr Brady began this work on behalf of the Channel Tunnel Company, but in July of the same year when the shaft was down to 82ft the operation was taken over by the Channel Tunnel Company. In July of the same year the Kent Coal Syndicate was launched by Mr Arthur Burr, who subsequently was responsible for the origin of the chain of companies which led to the development of the more successful area at Tilmanstone, Snowdown and Betteshanger. The late Mr George F. Fry, of Dover, was the chairman of the syndicate. The history of the Shakespeare Colliery is one of successive disasters, and after a few years, Mr Burr, convinced of the failure there, started the Kent Coal Concessions group of companies, which acquired mining rights over a wide area in East Kent, and proved coal by borings at various points. By 1912, fourteen borings had been made, at a cost of £150,000, and some 50,000 acres of coalfield had been proved under the mining rights area. At the Shakespeare Cliff sinking water difficulties were soon met with in the Brady Pit, which was stopped at a depth of only 360ft to wait for pumps. A second shaft, called the Simpson, or No. 2 Pit, was commenced in the autumn of 1896, midway between the Brady Pit and the borehole. When this had been carried down to 303ft, on the 6th March 1897 an inrush of water from the greensand suddenly engulfed the men working in the bottom, and eight of them were drowned. As a substitute, another shaft. No. 3 Pit, was commenced over the borehole in February 1898, and to cope with the water a tunnel was driven at a depth of 310ft between No. 2 and No. 3 Pits, to form a lodgement for the installation of pumps. At a depth of 450ft the total water that had to be dealt with was 54,170 gallons per hour. Financial difficulties and law suits came with the water trouble, the only ray of hope being the discovery, in 1899, of a thick bed of ironstone. Work ceased pending reconstruction, and the “Klondyke Express“ — the sinkers’ train to the works—ceased to run. In 1901, the Kind Chaudron method of sinking was adopted to overcome the water difficulties. By this tedious and costly method of lining the shaft with metal rings, No. 2 Shaft was carried down to 1,195ft—passing the first coal seam en route. A new administration had carried the sinking down to 1,600ft by August 1905. Five of the seven so-called workable seams of Mr Brady’s boring were passed by as too thin, but at 1,600ft there was a 2ft seam. Water came in, however, at the rate of 10,000 gallons an hour, and sinking was suspended. It was then decided to continue the sinking of No. 3 Pit, but soon the Company, Kent Collieries, Ltd., came to the end of their resources, and sold the venture to the Channel Collieries Trust, Ltd.—associated with Messrs Dorman Long, Ltd. They installed better pumps, and took No. 3 Shaft down to the coal measures, and in May 1914, the 2ft seam was reached and a certain amount of coal was raised. But the problem of water entering the workings continued and in 1915 war added to the difficulties and it was decided to seal off the coal measures, there being still some hope that the iron ore bed might be exploited. But this idea was soon abandoned and after the war the colliery plant was dismantled and sold. The "Klondyke Express“ was the name given to the train which carried the miners who put down the shafts of the Dover Colliery, near Shakespeare Cliff, over 80 years ago. Bat this train steaming; away from the colliery is believed to have been photographed some time later, in the early part of this century. Its trucks appear to be carrying not coal but pit waste. Behind the train is the winding machinery of two of the shafts from one of which coal was raised in 1914. Pit machinery was steam-powered and the pictures above and below show the tall chimney of the steam generating: plant which for a number of years formed an additional landmark on the East Kent coastline. The railway track is the main line from Dover to Folkestone. The top view is from the Warren side of the pit. Well, no need for back numbers any longer as the entire series has been published here. Scanned, processed, corrected and added to by myself, Paul Skelton, in a quiet period between teaching jobs 30 July 2017, whilst the pupils are on their summer breaks.